I think after China I could live in Belize, the Philippines, or Malaysia. And I say that not having been to any of the countries on the list. South America just doesn't seem my speed. But then, who knows? Just thinking of getting out of this dump and going somewhere interesting for a new and nicer life is lifting my spirits. And it might actually happen too! So, what is a good place to retire? Presumably, higher scores means better. Now in New & Improved Picturescope via HuffPo. See you on the coast in Thailand or the Philippines. I'm heading to Malaysia when i eventually leave here. Money is one thing. There are also a million other factors to consider and which is important to you. 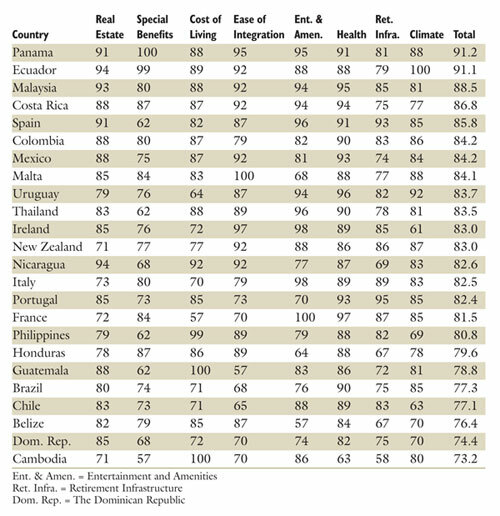 For example, Thailand makes it real easy for people to retire there. I don't know what Thailand's like outside of Bangkok. Fairly rural? I have no idea. I had a few weeks in central Bangkok and decided it was essentially an overgrown country town. But great for food. Ideally, I'd like a beach. And a view. And restaurants. About the last thing I like is cooking for myself. There has to be good, cheap, simple restaurants. Thailand has those, I know. I think probably Asia is where I'll stay. I could see myself in Europe, maybe. The Americas is another adventure and it might work well, but the prospect is more immediately daunting than it is retiring. I grew up near the ocean (on the edge of a city that might reasonably be called a giant suburb, which I still find claustrophobic every time I visit, it's clean and varied but somehow spartan and empty, though the water is great and the air far more expansive than here), and wouldn't mind living near water again. But modern communications infrastructure at least is important to me, as is some ability to get around by myself. So, things to see, a place to eat, some hot sun and humidity, some water, and some high speed internet. And something to do. I'm 46. I probably have to work another twenty years. But I was actually thinking, I could go do all this right now. If you really can do this on about 1200USD a month, I could kick back for a year or three. I'd be broke after that, but perhaps a rich lady would marry me for my wealth of knowledges. The other question too is, do you horde enough money to retire completely and then go to these destinations or do you horde enough to go there are set up a retirement? That is, make your bundle in some other place then jet off to balmy vistas or do you look upon the balmy vistas as your final place of work? Pretty much all those places listed have English as a second language, and need teachers or managers. The systems there are likely more professionally exacting than here, and perhaps even much fought over by expats, but maybe one could work there. Maybe. Going from working to doing no work is a bit of a shock, as I discovered. Ideally, a retirement with one or two days a week of work suits me now. And if that extra money is just icing, it pays for some luxuries such as our 4 weeks in Europe recently. Personally, I'd go for Turkey. Istanbul is great, but a bit expensive. Malaysia and Sri Lanka both do good expat retirement deals but, like Thailand etc., the weather doesn't suit me. I came across a lot of expat retirees in Penang who said they loved it though. Fairly good health care, and we are accessible to US/Canadian expertise (2-3 hours away by plane). Climate is pretty decent, except August/September when we get very humid and the occasional hurricane ventures past. Language is "English", with Bermudian accent - usually comprehensible to others. Money is dollar, on par with US. Cost of living is ... high. I'm still 46. I still want to retire. I still don't have enough money and probably never will. We have had one of these threads before.I agree that money is not everything.We are already retired.We came back to Israel after China and found it sooo expensive here.WE can't afford to eat out,go drinking etc whenever we want as we could in China.Here we have to pay more for the car (didn't have one in China) and we don't enjoy it at all.Despite the fact that here we have better theatre,movie choices,shows etc,it doesn't help because I am essentially unemployable (too old) or offered a risible amount per hour.Private lessons are drying up because with the economic situation people are not doing them.The gym is expensive too,so I am getting fat. So we started investigating Panama, Mexico,Costa Rica or Ecuador.Panama has jobs but not available before you arrive.None of those will offer me a deal even close to what we had in China.So granted you get better internet,but CR is overrrun with Americans,Mexico is reportedly dangerous and Ecuador gets cold.I am not a beach person,so Philippines doesnt' appeal to me and I heard the food is crappy.So we are thinking go back to China till I can't work any more and then think some more.I am currently 57. That gives me 3 more years or so to look for another destination.